Billy Goat's new PW30A0V 3,000 PSI pressure washer is durably built for the rigorous demands of any job, any site. Its light weight corrosion resistant aluminum frame offers easy maneuvering. 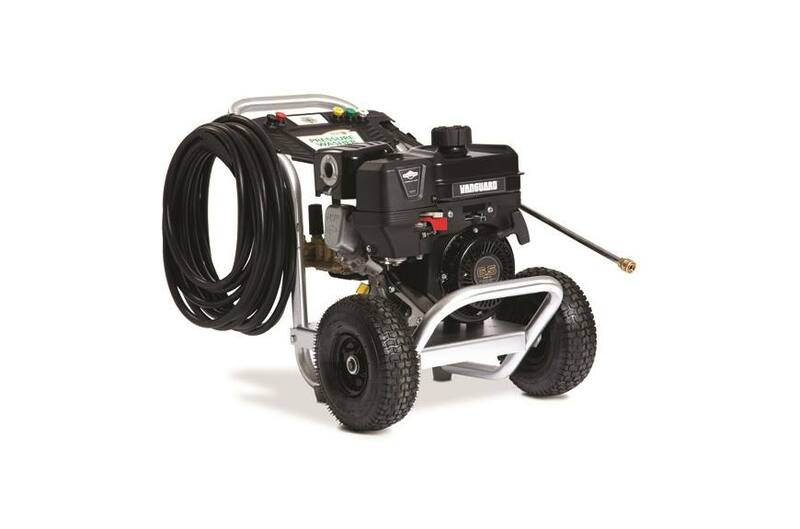 The Annovi Reverberi™ triplex pump is powered by a commercial Vanguard™ 205 cc engine for lasting performance on any job site. The unit has a 3 gal. / min. capacity and includes five onboard quick connect nozzles for 0, 15, 25, 40-degrees and detergent. Annovi Reverberi™ Triplex Pump: Die-cast pump body and forged brass head. Light-Weight Corrosion Resistant Aluminum Frame: Also aluminum bumper and base. Maneuvers with ease. Nozzle Wand & Hose Holder: Onboard convenience for quick connect nozzles, wand and hose. Spray Gun & Wand (PW30A0V): Standard. Spray gun has insulated trigger with safety lock-off. Replacement Part No. 80016529. Wand is 20" length stainless steel. Replacement Part No. 80013797. Onboard Braided Stainless Steel Hose: With quick connects. 3/8" x 50' length. Standard. Replacement Part No. 80012618. Quick Connect Nozzles (PW30A0V): Pre-defined spray patterns for precise control. 0, 15 25, 40-degrees & Soap. Standard. Replacement Part No. 210600.